Making music is in the blood of violinist Khris Ansin. His grandmother, Winifred Broughton, taught violin for more than 60 years in Dunedin and his mother, Jocelyn Broughton, will be presented with a St Cecilia Examinations diploma in cello teaching tonight. Mr Ansin will demonstrate another side to his music-making talents when he performs Paganini’s Violin Concerto No 4 in D Minor at the graduation ceremony on a violin he made himself. The 19-year-old University of Otago performance and chemistry student was inspired to make the violin after an unfortunate incident last year. “My original violin got run over by dad in the car,” he said yesterday. Mr Ansin constructs the instruments from maple wood for the back and sides and spruce on the front. “They take a couple of months to make, because I do everything from scratch. But, the secret to the tone of a violin is in the varnish,” he revealed. 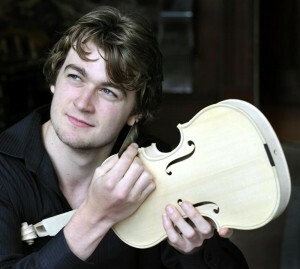 His dream is to study at the home of violin-making in Cremona, Italy. “I took my grandmother’s violin to a Christchurch maker to be valued. He said anyone who wanted to become a maker is crazy. There’s no money and it’s the hard life of a musician; full of anxiety and depression,” he grinned. His favourite maker is 16th-century Italian craftsman Andrea Amati, who was the maker of the oldest violins still in existence. The concert and ceremony will be held from 7.30pm today in the Mornington Methodist Church. via Accident led to violin making | Otago Daily Times Online News Keep Up to Date Local, National New Zealand & International News. This entry was posted on Friday, November 26th, 2010 at 7:04 pm	and is filed under Fiddle news and fun. You can follow any responses to this entry through the RSS 2.0 feed. You can leave a response, or trackback from your own site.